We agreed the aesthetic approach would echo the look of the Bill Atkin cutter, Tally Ho Major. I prepared the preliminaries. We chose Jim Betts’ boatyard in Anacortes, Washington, as the builder and the three of us arranged a meeting to get the project going. We made boat small talk. 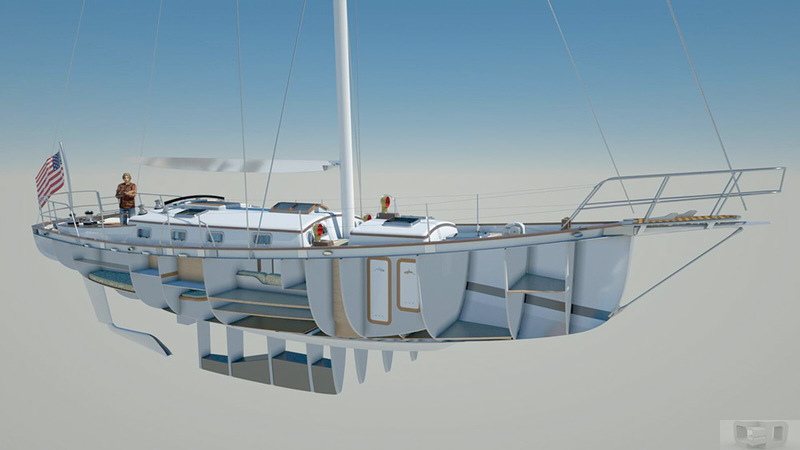 The builder presented his price, sans rig, sails and electronics. The client asked if the builder would build on time and materials. The builder said yes. Then the client said, “Fine, I’ll take four. When can you start?” No, not all projects start like this. The answer every time is, “Because that’s what the client wanted.” As the designer it’s my job to give the client everything he or she wants while making myself happy with the design. The hull is heavy with a D/L of 279 and an L/B of 3.23. There is considerable deadrise to the sectional shape throughout. Early on we made the decision to go with internal lead ballast. We had sufficient volume in the keel to hold the ballast low and get a very low VCG. This was helped by the other early decision to go with an all carbon fiber hull and deck. That’s right, carbon fiber, epoxy and Corecell foam. Jim Betts has built 15 carbon fiber boats and believes that carbon fiber is the ultimate boatbuilding material today. Jim did not have to work hard before the client was convinced. I may be wrong, but I do believe that this will be the very first traditional—styled boat built in all carbon fiber. E-glass is used with the carbon fiber in the keel fin to build up thickness for durability. We chose my old buddy Jim Antrim to do the engineering for us. 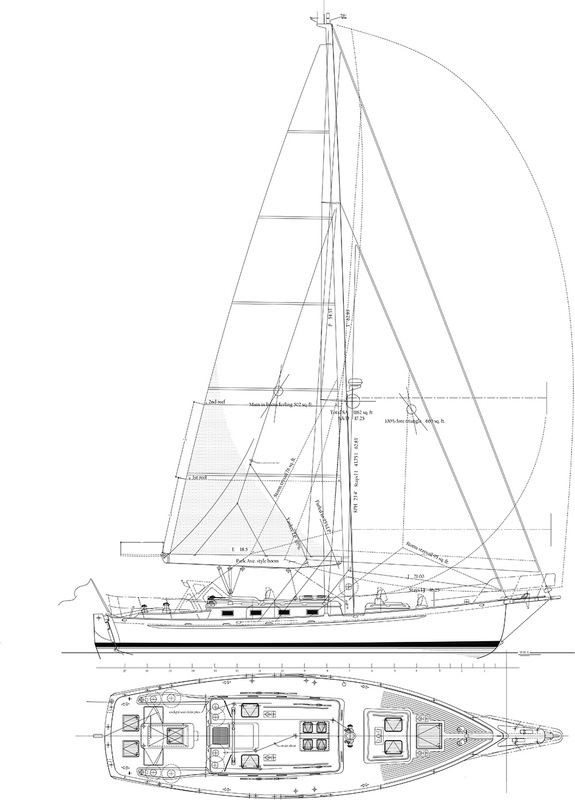 The treatment of the full keel was my idea and the C-strut that connects the aft end of the keel with the rudder is carbon and filled solid. The shape of the C-strut was designed by my pal Jody Culbertson III. Jody has done the 3-D modeling work on several of my projects and now we work as a seamless team. When we got to the strut shape I did not like my own ideas and I handed it over to Jody, a sailor, a glider pilot and an artist. The outboard rudder is also 100% carbon fiber with three titanium pintels that fit into carbon fiber gudgeons. The entire rudder blade weighs 110 pounds. The interior layout is focused on keeping a crew comfortable and safe offshore on long passages. All the berths are good, snug sea berths. There is a large freezer forward of the starboard quarterberth. There is a drawer-type refrigerator in the aft galley. The stove will be a gimbaled combination microwave and induction cooktop. 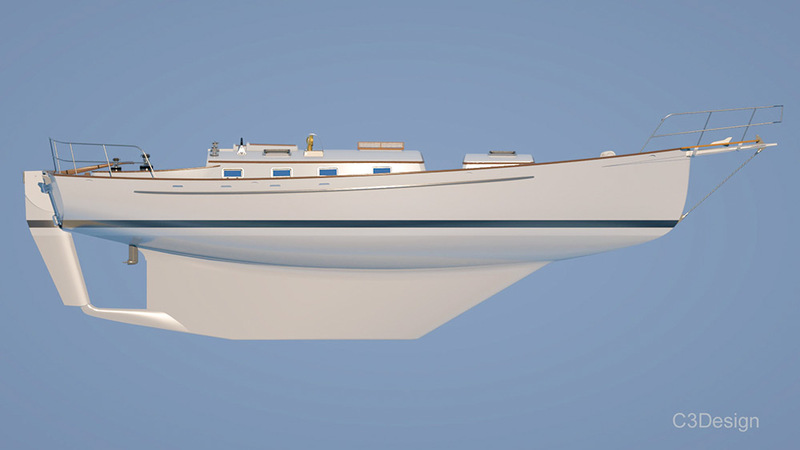 Large battery banks will be under the settees and all the tanks are in the bilge and keel envelope. All this helps keep the VCG very low. Forward there is a mudroom that leads to the head to port and the large shower stall to starboard. Forward of this there is the fo’c’sle with watertight doors fore and aft, and forward of that is the split chain locker. Aft there are watertight doors port and starboard that lead to the engine compartment. Nope, this is not your typical interior layout. The rig is pretty much a standard cutter rig. I’ve done lots of them. All the spars, including the bowsprit, will be carbon fiber. The boom will be a Park Avenue-style boom for easy furling. The chainplates are carbon fiber coming off the hull sides. The SA/D is 17.25. The tiller steering is to the owner’s requirement. Winches will be Andersen with four of them being powered winches. A 6-inch-high bulwark will keep you feeling secure aboard. “Why?” I don’t have the room to explain fully here. Use your imagination. Jim Betts and his crew are amazing. I go to the yard at least once a week. It’s exactly a one-hour drive from my beach shack through beautiful farm fields. I love being at the yard. The workers are patient with my endless questions. We are trying hard to take advantage of carbon fiber in every way we can. There is no question in my mind that there has never been a boat of this style built like this before. Our boat, with its carbon fiber structure, will have a very low VCG and will be a powerhouse. I am very fortunate to have landed this project. LOA 42’6”; LWL 38’6”; Beam 13’3”; Draft 7’; Displ. 35,600 lbs. Sail area 1,162 sq. ft.; SA/D 17.25; D/L 279; L/B 3.23; Auxiliary Volvo 55-hp saildrive; Fuel 200 gal. ; Water 300 gal.